Respondents in the Czech Republic (46.5%) seem to be most convinced that domestic B2B customers use outstanding invoices for their financial advantage. With an average of around 44% of the B2B sales value transacted on credit terms (slightly above the 40% average for Eastern Europe, and unchanged from last year), respondents in the Czech Republic appear to have a fairly more open attitude to using trade credit in B2B sales than their peers in the region. In Poland, the B2B credit-based sales average (35%) is below the average for the region (40%), and in Turkey (40.3%) it is aligned with it. Slovakia and Hungary are the two Eastern European countries least likely and most likely to grant credit terms in B2B trade. More specifically, 27% of the B2B credit sales value in Slovakia was transacted on credit, and 54% of the total value of Hungarian respondents’ B2B sales was transacted on credit terms. Consistently with what was observed in Slovakia and Hungary, and in contrast to observations in Turkey and Poland, respondents in the Czech Republic appear to be almost equally likely to offer credit terms to either domestic or foreign B2B customers (45.8% and 42.7% of respondents’ domestic and foreign B2B sales were on credit). Compared to their peers in Eastern Europe, however, they are more open to use trade credit in foreign B2B transactions (averages for Eastern Europe: 42.9% domestic and 36.6% foreign). This may reflect the fact that the Czech Republic is a relatively open economy, also dependent on the countries it has as export partners and their economic conditions. Nearly 93% of respondents in the Czech Republic (Eastern Europe: 85%) experienced late payment of invoices by domestic and foreign B2B customers over the past year. This resulted in an average of around 37% of the total value of B2B receivables remaining unpaid past the due date (below the 43% average for Eastern Europe). The payment timing of overdue invoices, however, evidences that the proportion of foreign, long-term outstanding receivables (22%), which are highly likely to turn into collection cases, is twice as high as that of domestic receivables of the same type. Compared to last year, the foreign figure recorded an average increase of 5%, signaling a worsening in the quality of Czech respondents’ foreign trade debtors. Late payment of (domestic and foreign) B2B invoices in the Czech Republic is reflected in the Days Sales Outstanding (DSO) figure posted by respondents. This averages 55 days (in line with the 57 days average for Eastern Europe) and is one week longer than last year. This DSO increase may reflect a lower efficiency in collecting high value, long-term outstanding invoices, particularly arising from foreign trade. The majority of Czech respondents (66%, same in Eastern Europe) expect no change in DSO over the next 12 months. Around 20% expect a deterioration of DSO over the same time frame. Twice as many respondents (30%) in the Czech Republic as in Eastern Europe consider a likely fall in demand for their products and services to be the biggest challenge to business profitability this year. This concern is not surprising for a robust economy dependent on strong domestic demand and a benign exports outlook, and which is projected to grow a solid 3.1% this year. Payment terms extended to domestic B2B customers by respondents in the Czech Republic average around 24 days from the invoice date. Foreign customers are requested to pay invoices on average three days later than domestic customers. Both domestic and foreign average payment terms are the shortest observed in the region, besides being well below the 30 days average for Eastern Europe. This points to a culture of swift payment in the Czech Republic. Over the past year, payment terms extended by Czech respondents to foreign customers decreased markedly, by an average of one week. This may be read as an attempt to offset the worsening of foreign trade debt quality by extending less lenient terms for invoice payment. Despite this, respondents in the Czech Republic had to wait, on average, three days longer than last year for overdue invoices to be paid by foreign B2B customers (average payment delay increased to 20 days from 17 days last year). This means that Czech respondents could turn foreign past due receivables into cash, on average, 47 days after invoicing (average for Eastern Europe: 52 days). Domestic overdue invoices, in contrast, were settled earlier (average of four days) than last year. This is in line with the solid economic landscape of the Czech Republic, as well as with the swift domestic payment culture observed earlier on in this report. Most respondents in the Czech Republic (around 47%) reported that late payment of domestic B2B invoices is most often due to customers’ liquidity issues (respondents in Eastern Europe: 64.4%). Interestingly, the same percentage of Czech respondents (respondents in Eastern Europe: 33%) said that late payment of domestic invoices is due to customers’ intentional use of outstanding invoices for financial advantage. This seems to be a much stronger belief among respondents in the Czech Republic than in the other countries surveyed in Eastern Europe (the percentage of Czech respondents citing this reason in respect to domestic late payment is the highest in the whole region). It is worth noting that twice as many respondents in Czech Republic (20%) as in Eastern Europe (10%) said that domestic B2B invoices are paid late due to disputes over the quality of goods delivered or services provided. Notably more respondents in the Czech Republic (31%) than in Eastern Europe (21%) said that foreign customers use outstanding invoices intentionally for their financial advantage. Similarly, more Czech respondents (26%) than Eastern European ones (15%) reported foreign late payment due to disputes over the quality of goods delivered or services provided. 36.4% of Czech respondents (Eastern Europe: 23.8%) attribute foreign late payment to the complexity of the payment procedure. As a consequence of B2B customers’ late payment, more respondents in the Czech Republic (nearly 32%) than in Eastern Europe (27.2%) reported that they had to postpone payments to their own suppliers. This is the highest percentage of respondents citing this delay of all the countries surveyed in Eastern Europe. To protect the business against payment risk, most respondents in the Czech Republic (38%, compared to 22% in Eastern Europe) will sell more often on cash terms to B2B customers. Around 35% of Czech respondents (25% in Eastern Europe) will check customers’ creditworthiness and payment history more frequently over the next 12 months. The proportion of B2B receivables reported by respondents in the Czech Republic as uncollectable (1.4% of the total B2B credit sales value) is in line with that at regional level (1.2%). Uncollectable receivables consisted almost entirely of domestic write-offs. Uncollectable B2B receivables originated most often from the construction and business services industries. Around 54% of respondents in the Czech Republic (in line with the percentage of respondents in Eastern Europe overall) reported that B2B receivables were uncollectable mainly because the customer went bankrupt or out of business. 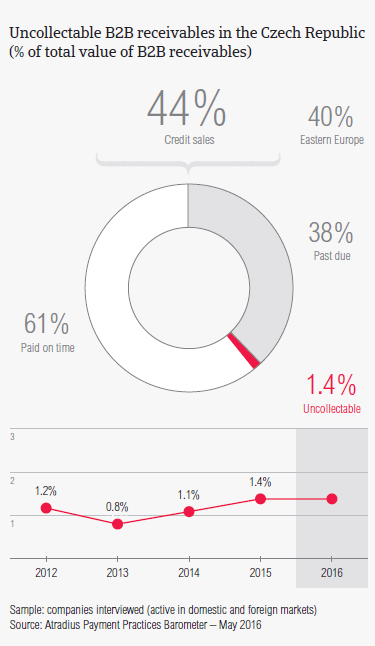 More respondents in the country (33%) than in Eastern Europe (23%) reported that B2B receivables were written off as uncollectable primarily because the customer could not be located. 27% of respondents (21% in Eastern Europe) reported that write-offs occurred mostly because the debt was too old. Survey respondents in the Czech Republic reported granting trade credit terms mainly to B2B customers in the construction, consumer durables, business services and services industries. Invoice payment terms extended by Czech respondents to B2B customers in the construction industry are significantly longer than the average payment term observed in the country (one month from the invoice date). Despite more relaxed payment terms granted to B2B customers in the construction industry, this generated an above average (for the country) proportion of past due invoices. According to most of the respondents in the Czech Republic (65%), slow payment from B2B customers in the construction industry is most often due to their intentional use of outstanding invoices for financial advantage. Around 70% of the respondents in the Czech Republic anticipate no significant change in respect to payment practices of B2B customers in the above mentioned industries over the next 12 months. Payments in the Czech machinery sector take around 40 days, with ‘days sales outstanding’ (DSO) for smaller businesses of about 50 days. Due to robust domestic demand and benign economic conditions in the Eurozone, Czech GDP is expected to grow 3.0% in 2015 and 3.1% in 2016. Trade successfully with the Czech Republic looks at ten principles that those seeking to expand into the Czech Republic should follow to avoid some of the pitfalls of trading in untried territory.